With LifeSize Express 220 users will receive Full HD video quality at 1080p30/720p60 for more natural and realistic interactions at lower bandwidths. The Express 220 also delivers crisp and clear data-sharing as well as a digital I/O with Full HD support. 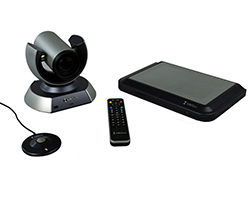 Lifesize Express 220 supports up to two high definition displays, a Full HD camera, and features phone or microphone options to deliver high flexibility.